Summer 2017 is here, water temperatures nearing 80', warmer mornings with slick calm conditions some days, loads of bait fish schools including mullet, menhaden, and sardines. Redfish scattering out on the flats and on backwater shorelines, seatrout hanging on the deeper drop offs hunting shrimp and baitfish, snook hugging close to structure to ambush their prey, jack crevalle and ladyfish schools making for fun light tackle catch and release rod bending. 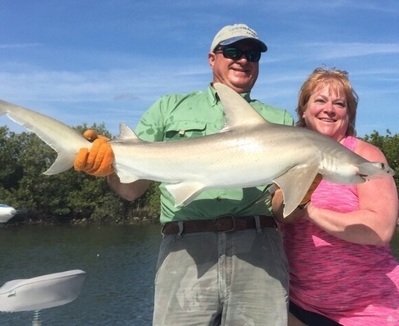 Summer bait choices range from live shrimp in the backwaters for variety catching as every saltwater fish eats a shrimp, to live finger mullet, pigfish, and pinfish. 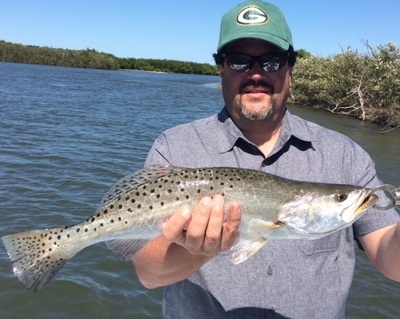 Seatrout fishing has been good both in the backcountry as well as off the edges of the flats in Mosquito Lagoon, Ron with a good Speck on one of my Indian River backcountry trips at Edgewater�����..
Repeat clients from Denver Mick and Kelly came with me on a 2 day charter, first day in the back waters for mixed bag catching, we counted 14 species from Trout to Snappers, Jacks to Ladyfish, Croakers to Spots , etc. Day 2 we hit the flats hunting Redfish was a windy day making it a little tougher but still caught several spot tails, Kelly and Redfish������. We also targeted some Trout of the edges with live pigfish catching several of those also, Mick and Redfish������. Kayla had a great time catching light tackle fish including some Seatrout�����.